This life changing book details Viktor Frankl’s experience in several different Nazi concentration camps and what he learned during this time. Before he ever went to these concentration camps, he postulated that man must live for a reason, have a meaning, in order to be truly happy. He proved this hypothesis first hand and helps show all of us that we can find meaning in any situation imaginable. The experiences of camp life show that man does have a choice of action. There were enough examples, often of a heroic nature, which proved that apathy could be overcome, irritability suppressed. Man can preserve a vestige of spiritual freedom, of independence of mind, even in such terrible conditions of psychic and physical stress. We who lived in concentration camps can remember the men who walked through the huts comforting others, giving away their last piece of bread. They may have been few in number, but they offer sufficient proof that everything can be taken from a man but one thing: the last of the human freedoms – to choose one’s attitude in any given set of circumstances, to choose one’s own way. Each task that each man must complete, and therefore the meaning of life, differ from man to man, and from moment to moment. Thus it is impossible to define the meaning of life in a general way. But for every one of the liberated prisoners, the day comes when, looking back on his camp experiences, he can no longer understand how he endured it all. As the day of his liberation eventually came, when everything seemed to him like a beautiful dream, so also the day comes when all his camp experiences seem to him nothing but a nightmare. The crowning experience of all, for the homecoming man, is the wonderful feeling that, after all he has suffered, there is nothing he need fear any more – except his God. Man’s search for meaning may arouse inner tension rather than inner equilibrium. However, precisely such tension is an indispensable prerequisite of mental health…Thus it can be seen that mental health is based on a certain degree of tension, the tension between what one has already achieved and what one still ought to accomplish, or the gap between what one is and what one should become. Our generation is realistic, for we have come to know man as he really is. After all, man is that being who invented the gas chambers at Auschwitz; however, he is also that being who entered those gas chambers upright, with the Lord’s Prayer or the Sherma Yisrael on his lips. Be so incredibly grateful about your circumstances, whatever they may be, for even Frankl, who lost everything but his meaning to live, still found a way to learn and benefit from his gut-wrenching experiences. Happiness must happen, and the same holds for success: you have to let it happen not by caring about it. I want you to listen to what your conscience commands you to do and go on to carry it out to the best of your knowledge. Then you will live to see that in the long run – in the long run, I say! – success will follow you precisely because you had forgotten to think of it. Does this not bring to mind the story of Death in Teheran? A rich and mighty Persian once walked in his garden with one of his servants. The servant cried that he had just encountered Death, who had threatened him. He begged his master to give him his fastest horse so that he could make haste and flee to Teheran, which he could reach that same evening. The master consented and the servant galloped off on the horse. On returning to his house the master himself met Death, and questioned him, “Why did you terrify and threaten my servant?” “I did not threaten him; I only showed surprise in still finding him here when I planned to meet him tonight in Teheran,” said Death. It is this spiritual freedom – which cannot be taken away – that makes life meaningful and purposeful. An active life serves the purpose of giving man the opportunity to realize values in creative work, while a passive life of enjoyment affords him the opportunity to obtain fulfillment in experiencing beauty, art or nature. But there is also purpose in that life which is almost barren of both creation and enjoyment and which admits of but one possibility of high moral behavior: namely, in man’s attitude to his existence, an existence restricted by external forces. A creative life and a life of enjoyment are banned to him. But not only creativeness and enjoyment are meaningful. If there is a meaning in life at all, then there must be a meaning in suffering. Suffering is an ineradicable part of life, even as fate and death. Without suffering and death human life cannot be complete. The way in which a man accepts his fate and all the suffering it entails, the way in which he takes up his cross, gives him ample opportunity – even under the most difficult circumstances – to add a deeper meaning to his life. A man who could not see the end of his “provisional existence” was not able to aim at an ultimate goal in life. He ceased living for the future, in contrast to a man in normal life. Therefore the whole structure of his inner life changed. We could say that most men in a concentration camp believed that the real opportunities of life had passed. Yet, in reality, there was an opportunity and a challenge. One could make a victory of those experiences, turning life into an inner triumph, or one could ignore the challenge and simply vegetate, as did a majority of the prisoners. Once the meaning of suffering had been revealed to us, we refused to minimize or alleviate the camp’s tortures by ignoring them or harboring false illusions and entertaining false optimism. Suffering had become a task on which we did not want to turn our backs. We had realized its hidden opportunities for achievement…there was no need to be ashamed of tears, for tears bore witness that a man had the greatest of courage, the courage to suffer. The rift dividing good from evil, which goes through all human beings, reaches into the lowest depths and becomes apparent even on the bottom of the abyss which is laid open by the concentration camp. Ironically enough, in the same way that fear brings to pass what one is afraid of, likewise a forced intention makes impossible what one forcibly wishes. 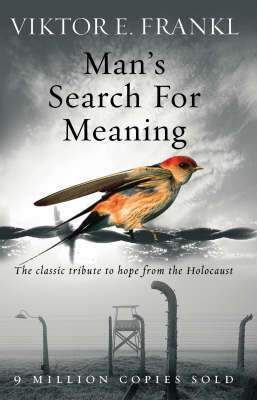 Frankl wrote Man’s Search for Meaning in 9 days! This entry was posted in Books and tagged Thought-provoking, Viktor Frankl on December 12, 2014 by Blas.